Transformation in mobility trends are changing dynamics of business especially in the restaurant and hospitality spaces. Point of sale systems the integral aspect of the hospitality business are seeing integration of new age mobile payment solutions that are disrupting traditional norms. If there was one central or defining element in a retail setup it has to be the point of sale (POS) system. Being the system that calculates the amount the customer has to pay for the product bought or service taken, it is a key element in the hospitality operations. 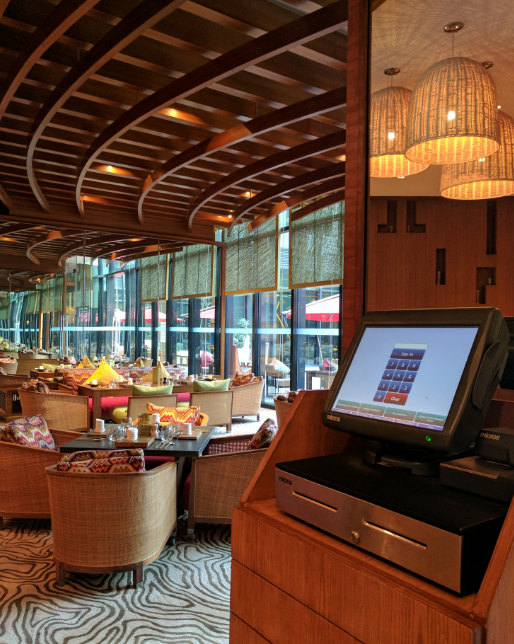 After the recent demonetisation move, diners are increasingly using cashless modes of payment and if ever there was a time for F&B outlets to go in for a POS system, in case they had not already invested in it, is now. So what are hoteliers doing in this space? Read on to know more. Before selecting a POS, the most important aspect is to know the kind of operations that you are going to run. “The requirement for a fine dining is different from a casual delicatessen (because of the retail sale component) and one in a QSR is entirely different because of sheer speed. The next thing to know is the scalability of the POS system if you are planning a multi-location / multi-city expansion. The reliability of the vendor and the technology platform used by him is also very important to know. One must also look for the user-friendliness of the POS, the reports that it generates and the security of the data. After sale technology support is also very critical,” says Anurag Katriar, ‎Executive Director, deGustibus Hospitality. “The PoS should be flexible in terms of expanding as per the store use. It requires low investment on Infra at Store level, smooth running on heavy billing, should be easy to use with simple basic training and should have the availability of live sale figures apart from having a robust inventory module,” adds Ahmed Raza, Head – IT, Barbeque Nation Hospitality Ltd. In fact apart from aspects like reliability and scalability, a key dimension of inter operability is being looked into while deciding on the POS system. Choosing a point of sale (POS) that is just right for your business is very crucial. Data theft or data breach is one of the biggest fears that guests have when it comes to using non-cash modes of payments. Hence the point of sales systems must safeguard the guests’ data. ““While data theft is definitely a risk in non-cash electronic transactions, audit trails are always built in for every transaction in any good POS. The companies should train and sensitise the POS users on the importance of log in and log out procedures and maintaining the sanctity of passwords. If multiple people are using one login ID then you run the risk. In fact, one can track even if an attempt is made to email or copy any data. The IT cell of the company or the POS provider must carry out random checks on these,” says Katriar. Again, while incorporating point of sales systems in an F&B outlet, the right security practices must be followed by the people on the floor to safeguard their guests’ data. This comes from training and sensitisation by the organisation. The other way to keep a track is to keep looking at any irregular activity on the system audit. On a practical note a CCTV coverage of the cashiering area also works as an effective deterrent. “Blocking of infiltration with highly secured network by using firewalls and antivirus with blocking and monitoring the malwares and tools is what we practice. Also for non cash payment through credit cards, e-wallets etc. we are ensuring that the confidential information of the guest is entered by himself on the device (swipe machine). In case of wallet payments, guests do the transaction from their own mobile devices so there is no need to provide the detail to us. This gives the confidence to the guest that his information is secured,” says Raza. A lot of hoteliers are also staying away from the cloud space to keep a tight control on security. “A POS system running on a computer is vulnerable; hence we have blocked all USB and data drive access. There is a strict authentication process for all associates to log-in into the system and audit logs maintained for the same. Also reporting tools should be available to identify risk,” avers Malcolm Moniz, IS Manager, Park Hyatt Goa Resort and Spa. Given the changes in transaction faced in the country in the last few months, hoteliers have adapted to it by introducing options of digital payments through third parties avenues. “We evaluated quite a few service providers and have had our teams do the due diligence with regards to safety and ease of access to make such payments. Where the amounts are small, these options can be used to make payments. However, for larger payments exceeding certain limits, our customers can choose to pay using the online facility we have. As it is still in the initial stages, we are evaluating scalability since our partner banks are also enhancing their portfolio of product services to include digital payments,” says Rohit Katyal – Head of Sales and Marketing at Justa Hotels & Resorts. A key factor of a POS system is the ability to have robust reporting tools inbuilt into the system to streamline real-time enterprise management from anywhere. Most hotels and restaurants have a central server at the corporate office where all masters are controlled. Outlets usually do not have the right to amend the masters. “We are currently operating in three cities without any problems with the Shawman POS. It has sufficient reporting and analytical tools which can also be customised to one’s requirement. We may however be using a different platform for our new brand as the operating style there will be significantly different,” says Katriar. However reporting systems via POS may not be very cost effective in cases of low transaction volumes. “Some of the features and capabilities that we look out for in an ideal POS system which are presently not in our POS Solution includes the option to customize daily routine report required by Finance / Controls department. Also the possibility of incorporating user-customizable reporting tool in the POS application and report scheduler option to auto email the day end reports automatically upon completion of night audit. We also need an integrated Business intelligence tool to facilitate Restaurant managers, F&B sales and marketing team to capture different trends and make their strategies to increase sale,” says Jain. It is essential that the POS system has several inbuilt protection walls and is password protected. “We also ensure reports are timely generated and we have a data log of several months in case we need to check old information, we definitely cannot have limited functionality where in data is erased every few weeks. It is essential that the POS generates daily, weekly, monthly and quarterly reports. We need specific breakdowns revealed like food costs, item consumption and stock opening and closing that our current POS supports,” opines Syesha Kapoor, Associate Director – Silver Beach Entertainment & Hospitality. “We currently do not have a real-time tool to identify suspicious transactions. XBR is the tool which needs to be incorporated. We try to operate systems that are highly robust and can help with growing business needs. Our current system covers all the outlets while having the capability to add more outlets if need be in the future. We will be upgrading to Oracle Simphony enterprise POS solution,” says Mahesh Pillai, Information Security Manager, Grand Hyatt Mumbai. The recent move of demonetization has also meant that new payment options like e-wallets must be supported. Also with changing times, smart phones and tablets have now become common place and these need to be able to be handled by the POS. In fact most organisations have ensured that e-wallets are incorporated as an additional mode of bill settlement and most hoteliers opine that adding new functionalities are an on-going function. “I think going forward we will need to look at POS systems to have the ability to handle conversion of different e-wallets so if you have say PayU and I have Paytm, I can use Paytm to transfer money to your PayU account,” opines Chatterjee. Naturally functionalities are constantly evolving and it is now important to choose tech services that are customizable to the exact requirements than pick one that is off the shelf and generic. “We are in a transitional phase of upgrading our technology which has the scope of scalability for the next many years. We are taking steady but effective steps in this direction to evaluate the available options. Our primary objective is to take as much as possible online and have it centrally managed while at the same time we continue to provide the convenience, transparency and safety to our end users, namely the front line staff and more importantly, our guests,” concludes Katyal. This story appeared in the Feb-17 issue of Hotelier India magazine: Hotelier India Feb-17.